I guess when you put a weird wig on Nic Cage you might as well really take advantage of it. Not only is he looking entirely silly in The Sorcerer's Apprentice, he's looking doubly silly endlessly frozen in scowl-mode in this new Season of the Witch poster. The poster come courtesy of Shock Till You Drop, where they have a higher-res version. While it's a bit of a variation on the widely panned floating head approach to movie posters, it's still a God damned floating head. 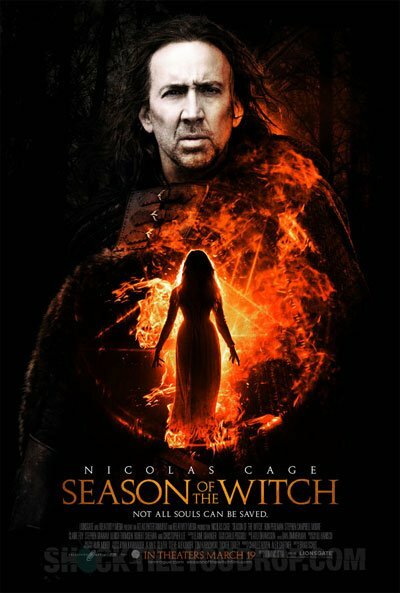 A big poster of a woman standing in front of a fiery pentagram would have made for some pretty cool wall décor, but instead we're subjected to Nic Cage's icy gaze until someone comes up with something better. STYD was nice enough to attach this detailed synopsis, which despite my weathered remarks about silliness, sounds like it might be interesting, especially with resident BAMF Ron Perlman involved. Cage stars as the medieval knight Behmen who undertakes a mission pitting him against an devious witch and making him the last hope for the world against an ancient and dark force. His faith broken by years of battle as a crusader, Behmen returns to central Europe to find his homeland decimated by the Black Plague. While searching for food and supplies at the Palace at Marburg, Behmen and his trusted companion, Felson (Perlman) are apprehended and ordered by the dying Cardinal to deliver a young peasant girl believed to be the witch responsible for the Plague to a remote abbey where her powers can be destroyed. Season of the Witch premiers March 18th. Start stocking up on crucifixes.